After fighting through weather delays and postponements for the better part of a week, the Owls fell 5-2 to the LSU Tigers in a game seven winner-take-all in the Baton Rouge Regional and a ticket to advance to this weekend’s Super Regional round. Willy Amador provided six shutout innings before being tagged in the seventh inning for three runs, which gave the Tigers a 3-2 lead. LSU added two more runs in the eighth inning to seal the victory. With the Owls leading 2-0 after two innings, the Tigers brought in reliever Jared Poche. Poche stymied the Owls over the next six innings, allowing only one hit while fanning six. A full write-up of the game by Rice baseball SID John Sullivan is below. Click on the play button to view a Flickr gallery of today’s action. To enlarge the gallery, click here. Six Rice Owls were named to the 2016 NCAA Baton Rouge All-Tournament Team: Pitcher: Glenn Otto; catcher: Hunter Kopycinski; second base: Grayson Lewis (Lewis led the tournament in hits); third base: Connor Teykl; outfield: Charlie Warren and DH Dominic DiCaprio. Click below to listen to the postgame news conference and comments from Lewis, Willy Amador and Coach Wayne Graham. BATON ROUGE, La. 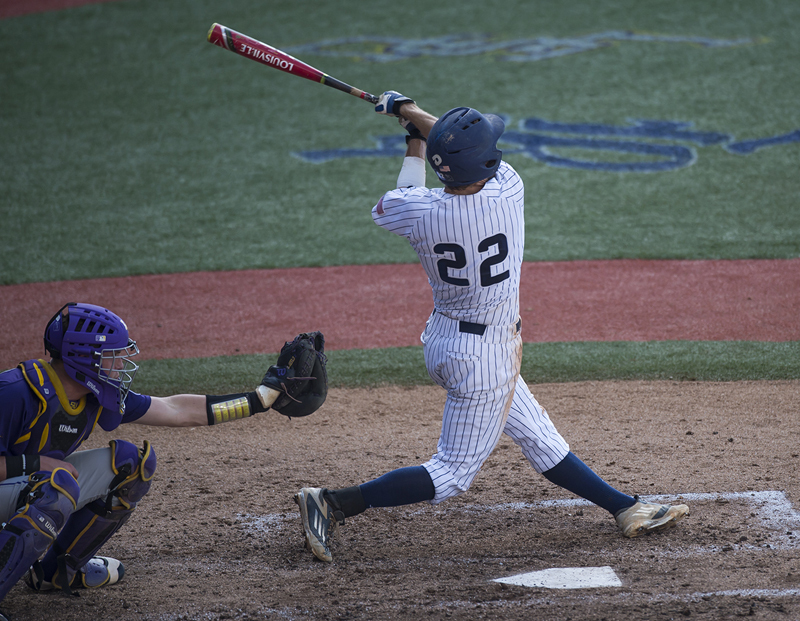 – With just nine outs to go to advance to the NCAA Super Regional round, the visiting Rice baseball team saw its seventh-inning lead slip away and Louisiana State University rally for a 5-2 win over the Owls Tuesday at the NCAA Regional in Baton Rouge. The Owls battled all the way to the end of an extended week of postseason play. Rice was the last team eliminated from making the Super Regional round and saw its successful 2016 season come to an end with a 38-24 record. The Blue & Gray took some of the spirit out of the 9,854 fans at Alex Box Stadium early in the game. A pair of Rice veterans quickly helped the Owls jump on the scoreboard for a run in the top of the first inning. Senior Grayson Lewis continued his hot postseason hitting pace, reaching on a slow bouncing ball that came to a stop on the dirt a few feet up the left baseline. Lewis alertly dashed to second base on an LSU wild pitch and scored easily on a two-out double into left field by senior Connor Teylk. The Blue & Gray added another run in the second. Ryan Chandler drew a leadoff walk and reached scoring position when Dayne Wunderlich was hit by a pitch. Senior Hunter Kopycinski followed with a single through the left side and the speedy Chandler dashed home easily for a 2-0 Rice lead. It was a welcome lead, but Rice knew it could have been even more. LSU successfully ended the inning with the bases still loaded, thanks to a sensational diving catch of a Ford Proctor fly ball by Tiger shortstop Kramer Robertson in shallow left field. Proctor was in fact twice-robbed, as LSU also made a catch in right (before Teykl’s double). Both plays could have gone a long way in giving the Owls a bigger lead to work with. Rice successfully kept LSU off the board for the first two-thirds of the contest, but the Tigers rallied in front of the loud home fans in the seventh. Jake Fraley drew a leadoff walk and Kramer Robertson slapped a base hit through the right side to put runners at the corners. Fraley scored on Bryce Jordan’s sacrifice fly near the right field bull pen. Greg Deichmann followed with a home run to center to give LSU its first lead of the day at 3-2. LSU added two insurance runs in the top of the eighth. After a solo homer by Michael Papierski, the Owls made a pair of fielding errors with two away. The extended frame allowed another Tiger run that made it 5-2 to close out the scoring. The Owls had a big, sensational start in the game from sophomore Willy Amador. The right-hander worked a career-long 6.2 innings in which he allowed three runs on four hits. On Rice’s offensive side, Grayson Lewis tallied another two hits to give him 10 in five NCAA Regional games – the most of any other player in the opening round of action. Lewis (2b), as well as Glenn Otto (P), Hunter Kopycinski (C), Connor Teykl (3b), Charlie Warren (OF) and Dominic DiCaprio (DH) were named to the All-Regional team. Pitchers: LSU – Jake Latz; Russell Reynolds (2); Jared Poche’ (3); Hunter Newman (9) and Michael Papierski. Rice – Willy Amador; Blake Fox (7) and Hunter Kopycinski. Win – Jared Poche’ (9-4) Save – Hunter Newman (8) Loss – Willy Amador (2-2). T – 2:34 A – 9,854. HR LSU – Greg Deichmann (10); Michael Papierski (3). The Owls will overnight in Baton Rouge before boarding the team bus back to Houston Wednesday morning.